This afternoon comes a report for Daron Butler, pastor of cross cultural missions at the Grace Brethren Church in Wooster, Ohio. 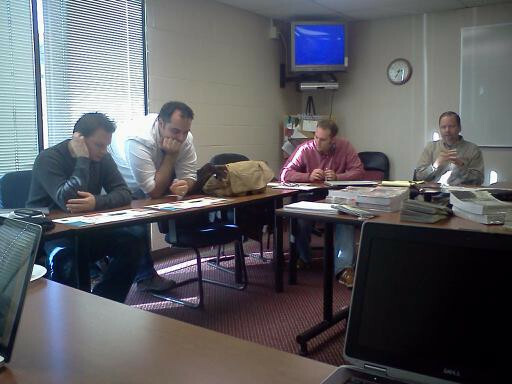 He shares about today’s meeting of paid staff mission mobilizers in Ashland, Ohio. Dave Guiles, executive director of Encompass World Partners gathered paid staff missions mobilizers in Ashland, Ohio. The gathering included paid church staff members responsible for mobilizing people to be on-mission to reach the nations in their local churches. Participants shared stories, insights, best practices, questions, challenges, and enjoyed fellowship together at the Ashland Grace Church. Those in attendance were: Dave Guiles, Executive Director, Encompass; Roger Colville from Grace Powell; Pastor Norm Johnson, Ashland Grace; Pastor Dan Green, Polaris Grace; Jay Bell, Winona Lake GBC & Encompass mobilizer; Pastor Tim Farner, Grace Powell; Pastor Daron Butler, Wooster Grace; Pastor Mike Jentes, Los Altos Grace; Ted Rondeau, Goshen Grace; Pastor Drew Waggoner, Grace Fellowship Pickerington; Pastor Joe Caruso, Grace Church—Bath; and Pastor Adam Speas, Grace Church—Norton.